Click the links above or the titles below to read the speaker bio and full presentation descriptions. DeAndre Upshaw Brings His Humor and Expertise to the Rocks Digital Marketing Q & A Panel! 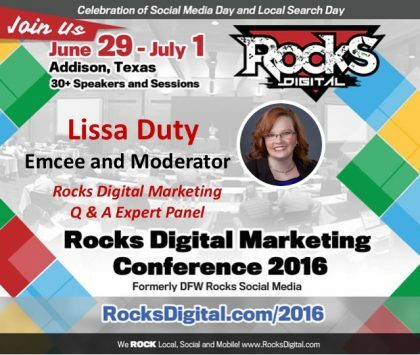 Join us at #RocksDigital 2016 in Addison, Texas for the Rocks Digital Marketing Q &A Panel, moderated by Lissa Duty, with panelists Bill Hartzer, DeAndre Upshaw and Heather Steele. Join us at #RocksDigital 2016 in Addison, Texas for the Rocks Digital Marketing Q &A Panel, moderated by Lissa Duty, with panelists Bill Hartzer and DeAndre Upshaw. Join us at #RocksDigital 2016 in Addison, Texas for Barry Schwartz's Keynote Presentation "What You Need To Know About SEO" in celebration of Social Media Day & Local Search Day! Join us at #RocksDigital 2016 in Addison, Texas for Eric Enge's Keynote Presentation "Opportunism and Being Holistic: What it Takes to Win in Digital Marketing in 2016" in celebration of Social Media Day & Local Search Day! Lance Bachmann Joins the Rocks Talks Lineup with the Now, New and Next of Mobile at Rocks Digital 2016! Join us at #RocksDigital 2016 in Addison, Texas for Lance Bachmann’s Rocks Talk "The NOW, The NEW, The NEXT in Mobile" on Social Media Day. Join us at #RocksDigital 2016 in Addison, Texas for Patty Farmer’s Rocks Talk "Social Selling: 5 Steps to Putting the Social Back in Sales" on Social Media Day. Eve Mayer Talks Transparency and Brand Management at Rocks Digital 2016! Join us at #RocksDigital 2016 in Addison, Texas for Eve Mayer’s Rocks Talk "Hyper-Transparency and Social Care" on Social Media Day. Join us at #RocksDigital 2016 in Addison, Texas for Elayna Fernandez’s Rocks Talks "Life IS A Fairy Tale – 5 Principles To LIVE Your Magic Life" on Social Media Day. Join us at #RocksDigital 2016 in Addison, Texas for Mark Traphagen’s Rocks Talks "The Best SEO Strategy" and breakout session on "Why Mobile is the Game to Be in". Join us at #RocksDigital 2016 in Addison, Texas for Mike Stewart’s presentation "Rising Above the Rest for Local Search Success". Join us at #RocksDigital 2016 in Addison, Texas for Ruth Burr Reedy’s presentation "SEO for the Customer Journey". 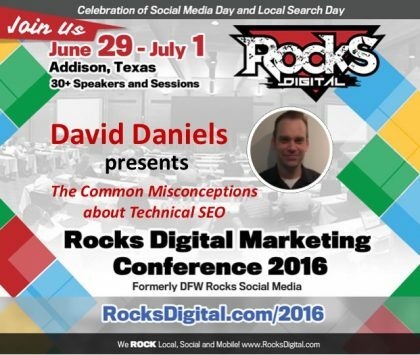 Join us at #RocksDigital 2016 in Addison, Texas for David Daniels' presentation "The Common Misconceptions about Technical SEO". Join us at #RocksDigital 2016 in Addison, Texas for the "Mobile Web, Apps & AMP Geek Chat" moderated by A.J. Wood with panelists Robin Moss, John Nosal and Jeff Whitfield! It's time to turn up the GEEK! Join us at #RocksDigital 2016 in Addison, Texas for the Mobile & Web break-out sessions and Geek Chat: Mobile Web, Apps and AMP moderated by A.J. Wood. Join us at #RocksDigital 2016 in Addison, Texas for Taylor Bare’s presentation "Setting Up Your WordPress Website For Success". Join us at #RocksDigital 2016 in Addison, Texas for the social media break-out sessions, emceed by Laurie Shook. Join us at #RocksDigital 2016 in Addison, Texas for Litany Bergeron’s presentation "7 Tips To Maximize Engagement for Brands on Social Media". Join us at #RocksDigital 2016 in Addison, Texas for Roxanne Roark's Social Media Day presentation "Social Search: The Impacts of Social Media on Search Engine Optimization". Join us at #RocksDigital 2016 in Addison, Texas for John Sparks' Social Media Day presentation "How To Make Money & GROW BIG On TWITTER!". Join us at #RocksDigital 2016 in Addison, Texas for the podcasting panel, moderated by Mitch Todd with panelists Caz Gaddis, Gary Leland and Erin Smith! It's time to start podcasting like a pro. Join us at #RocksDigital 2016 in Addison, Texas for the podcasting panel, moderated by Mitch Todd and start podcasting like a pro. Neil Lemons Serves Up the Secrets to Building a Hyperlocal Media Empire at Rocks Digital 2016! Join us at #RocksDigital 2016 in Addison, Texas for Neil Lemon’s presentation "How to Become a Hyperlocal Media Mogul & Get VIP Status Everywhere You Go". 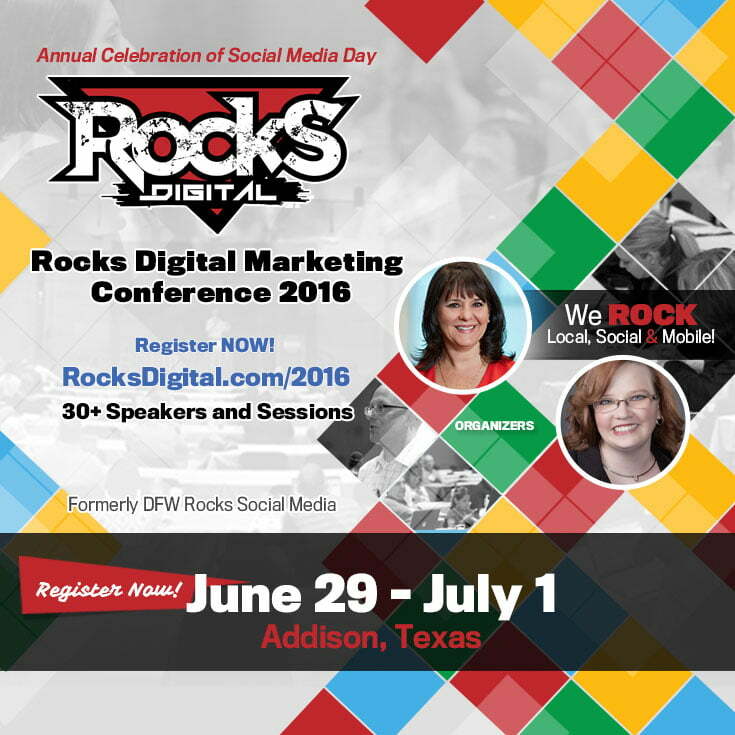 Learn Infographic Design 101 with Randy Krum at Rocks Digital 2016! Join us at #RocksDigital 2016 in Addison, Texas for Randy Krum’s presentation "Cool Infographics: Examples, Tips & Tools". Join us at #RocksDigital 2016 in Addison, Texas for the business development break-out sessions, emceed by Heather Nichols. Amy Kinnaird Brings Skills for Marketing Your Own Brilliance to Rocks Digital 2016! Join us at #RocksDigital 2016 in Addison, Texas for Amy Kinnaird’s presentation "Marketing Hacks for Non-Marketers: You're Brilliant at What You Do. It's Time to Get the Word Out!" Join us at #RocksDigital 2016 in Addison, Texas for Judy Hoberman's presentation "Marketing Gets You Known, Sale$ Gets You Paid". Join us at #RocksDigital 2016 in Addison, Texas for Tanya Smith's presentation "Snack Size Everything: The Fine Art of Using Micro Content to Capture Attention on Social Media".